Success in electoral politics depends—in great part—upon adeptness in the art of myth-making. And one of the greatest myths of today's California politics is that Jerry Brown had a successful eight year run as mayor of the city of Oakland. Jerry Brown's time at Oakland City Hall was a success...for Jerry Brown's political career. Brown jumped from mayor of Oakland into the office of California Attorney General, and he is now the Democratic nominee for the office of California Governor in the November, 2010 election. But for the city of Oakland and its citizens, Jerry Brown's mayoral tenure didn't work out quite so well. Unfortunately, most California voters don't know this fact. Memories fade, and voters don't usually have the time to do the proper research. In addition, many people loyal to the California Democratic Party do not want to present to the public an independent view of the Jerry Brown years in Oakland, for fear that such an analysis would hurt the gubernatorial campaign of Jerry Brown and help the campaign of his Republic opponent, Meg Whitman. And so the impressions of Jerry Brown In Oakland are now being largely built by the myth machine of Jerry Brown. But some of us have not forgotten and, fortunately, we kept records. During the Oakland Mayor Jerry Brown years (1999 through 2006), I was a newspaper reporter and political columnist in Oakland. I wrote a long series of political columns about Mayor Jerry Brown, first for Oakland's old UrbanView newspaper (now defunct), and then for the Berkeley Daily Planet. I have reposted those columns on the veryjerry.org website so that California voters can see another view—a first-hand journalist's view—of how Jerry Brown governed Oakland. It is my hope that this may give a better idea about how Jerry Brown might handle the job as governor of the State of California, if he is elected in November. Late in 2006, when Jerry Brown was running in the November General Election for California Attorney General, I wrote a column ("No Longer Oakland's Problem") that sums up my feelings about the Mayor Jerry Brown years in Oakland. That column is reprinted below. Just like Jerry Brown, too many high-placed Democratic officeholders too often abandon the traditions and philosophies of the Democratic party when carrying out their official duties these days, hoping that progressives will keep quiet in the November elections to keep from giving aid and comfort to conservatives and Republicans. But if we always keep quiet, how will this pattern ever end? Oakland is my home town. I love the city and its people too much to keep quiet when its public officials abuse the power we have given them. And so I choose not to hold my tongue about the years of the Jerry Brown Administration in Oakland. The columns speak for themselves, and no other explanation is necessary. It is possible that this website might help the campaign of Republican Meg Whitman who, if anything, would be a worse California governor than Jerry Brown, in my opinion. That cannot be helped. Voters should always go into the booth with their eyes open. If Jerry Brown is to be our next governor, at least Californians should not be able to say that we have not been properly warned. Some time ago, maybe more than once, I predicted in this column that in his campaign for California Attorney General, Mayor Jerry Brown was going to use his Oakland track record in a different way than most politicians usually do. Politicians generally spotlight their positive achievements in office, and in his race against State Senator Chuck Poochigian, Mr. Brown has certainly done that. But in areas where Mr. Brown has failed in Oakland–and their were many such failures–he has excused those failures by putting the blame on Oakland. In effect, he’s been telling California voters that Oakland was so bad, nobody could fix it, and wants voters to give him points for even giving it a good try. And so, I was not surprised when a Sacramento television station (KCRA) posted a story on Mr. Brown’s campaign on its website last week in which Mr. Brown seemed to be exploiting Oakland’s crime rate to boost his own credentials. The story read, in part, “Jerry Brown is fixture on the streets near his Oakland condo. During the day it's a fairly safe place to walk his dog, Dharma, but at night it's a different story. ‘Well, there was a killing right there at the KFC, another one right there, and then a shooting over there at the karaoke club,’ Brown said. ‘If you want a crime fighter,’ [the mayor continued], ‘you ought to have someone who knows what crime is. I've picked gun shells off the street not 100 feet from where we're sitting.’"
What logic there is to this type of thinking escapes me, as much has escaped me in the last eight years about how Mr. Brown thinks. If living in a neighborhood where crime occurs qualifies one to be elected as a crime fighter, then one might as well argue (as I once wrote in a short story) that it makes sense to elect a dead man as coroner because, after all, who knows the needs of the dead better than a dead person does? Logic or illogic aside, there is something ghastly and unconscionable about the elected mayor of Oakland leading reporters around pointing out killing spots–not as a way to prevent more Oakland killings–but to somehow show off his credentials for a “higher” office. Still Californians, who often have no trouble recognizing hypocrisy and demagoguery when it comes to national Republicans, seem to miss it entirely when it comes to the homegrown variety. Maybe so. 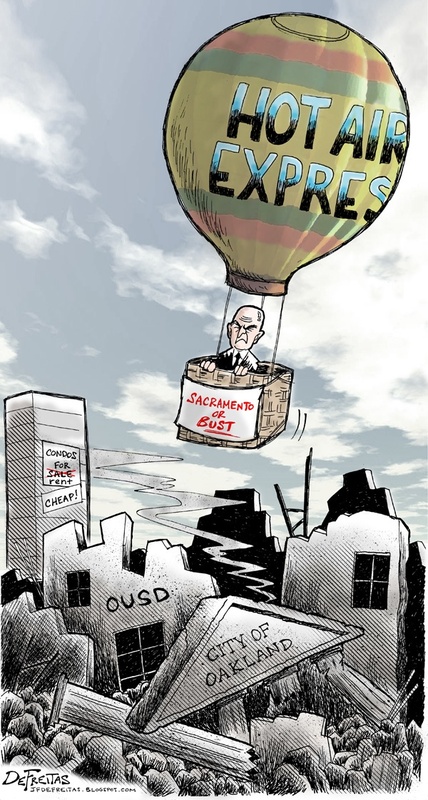 But it was also Jerry Brown, in a hurry to meet his goal of 10,000 new inhabitants in downtown Oakland, who induced the legislature to pass AB436 in 2001, a Wilma Chan-sponsored bill that suspended portions of the California Environmental Quality Act in downtown Oakland, and downtown Oakland only. In reporting how Mr. Brown explained that full-blown CEQA environmental protection wasn’t needed for downtown Oakland, San Francisco Chronicle columnist Chip Johnson reported Mr. Brown saying in 2001 “I haven't seen any spotted owls or snail darters in downtown Oakland." Perhaps that was supposed to be a joke–Mr. Brown often finds serious policy questions funnier than the average observer does. But it later became a public policy argument advanced by others. In a 2002 Oakland City Council meeting, then-Oakland City Councilmember Danny Wan defended his support for that bill by arguing that CEQA was passed in 1970 more as protection for rural and suburban development, not urban development. Therefore, Mr. Wan asserted to fellow Councilmembers and the public, easing certain CEQA protections in downtown Oakland wasn’t really a weakening of CEQA’s environmental protections, since those protections weren’t aimed at cities anyway. It was a dangerous (as well as completely incorrect) notion, then and now, all set loose by Mr. Brown, who was willing to sacrifice long-established environmental protection principle for short-term gain. What is true about the environment is also true about education. Mr. Brown promised to promote and support quality education in Oakland in his initial campaign for mayor and based upon that promise, Oakland citizens later passed a ballot measure giving the mayor the power to appoint three new members to join the seven elected members of the Oakland Unified School District board of trustees. Armed with that power, Mr. Brown immediately abandoned it, seeming to lose any interest in the day to day workings of the district, and apparently leaving his appointees with no clear instructions on what policies he wanted them to follow. Instead, Mr. Brown put all of his energies into his two charter schools, the Oakland School for the Arts and the Oakland Military Institute, to which he donated many hours of city staff time and many thousands of dollars in city money. How successful have those experiments been? The military institute recently failed not only to reach its state-mandated Academic Performance Index goal of 6 points (to 677 on a scale of 1000), it actually lost 13 points over the 2005-06 school year. Mr. Brown’s arts school did even worse. The state gave it a goal of a 3 point API rise to 741; instead of making that goal, OSA dropped 18 points over the past school year. When things seemed to be going good at the two schools, Mr. Brown couldn’t stop talking about them. Now that they are falling on tougher times, all mention of them appear to have been dropped from his public pronouncements. Poor children. Meanwhile, while Mr. Brown had three appointees to the Oakland school board (compared to seven electees from all of the rest of Oakland citizens), the Oakland school district came close to bankruptcy and was taken over by the state, and has been on a downward spiral ever since. Under less dire circumstances, the city of Emeryville figured out a way to legally transfer city funds to the school district to help win back local control for that district, and Mayor Antonio R. Villaraigosa down in Los Angeles got the state legislature to pass a law giving the LA mayor’s office authority over the school district. Does Mr. Brown take any responsibility for the events that led to the state takeover of the Oakland schools, or is he now offering some plan to help the district get back on its feet? Last week, former Oakland city employee Nereyda Lopez-Bowden surfaced in Sacramento to remind us of that Mr. Brown’s former roommate and longtime confidante–Jacques Barzaghi–was once sanctioned for sexual harassment of Ms. Lopez-Bowden after Mr. Brown put him on the city payroll. After Ms. Lopez-Bowden appeared at a press conference sponsored by Mr. Brown’s Attorney General opponent, Chuck Poochigian, Mr. Brown’s campaign consultant, Ace Smith, remarked “it's clear Chuck Poochigian has finally crossed the line from desperate to undignified. Anyone who has looked into this matter knows it was handled by an independent professional with lots of integrity." But the question was not whether the investigation–coordinated through the office of Oakland City Attorney John Russo and City Manager , and not through the office of Mr. Brown–was not thorough and professional. And the punishment seemed fair–three weeks suspension, counseling, and a restriction that he couldn’t be in the room with a woman staff member by himself (all imposed by City Manager Robert Bobb, not Mr. Brown). But the question was, why did Mr. Brown allow his friend, Mr. Barzaghi, to remain on the city payroll after the sexual harassment charges were proven? In fact, once returned to his job after his suspension, Mr. Barzaghi was treated to a raise in salary. It would seem in this case, Mr. Brown’s loyalty to an old friend trumped whatever commitment the mayor may have to women’s rights and cracking down on workplace sexual harassment. And that, in the end, has been the problem with Jerry Brown in Oakland. You cannot rely on Mr. Brown’s principles, regardless of how cleverly he states them or how many times, only that he will violate them, at will, when it is necessary for his personal political future and agenda. That is no longer Oakland’s problem, however. Not, at least, by ourselves. On the eve of next week’s general election, it would appear that Mr. Brown will soon belong to all of California, again. Good luck, California. Questions about the How Very Jerry website can be submitted to admin@veryjerry.org. Please notify us of any errors or broken or bad links in the site.